We are spending more time in our homes. Maybe we should create garden spaces that enrich us. A meditation garden was my wife’s wish. Most homes that I inspect do not have a great deal in the garden areas. Plain yards fill my day with possibly a garden table in the grass. The garden space in my yard has quickly filled up, yet my wife had a request for a meditation garden based upon a church garden she and my girls had seen. After I began working on this garden, I noticed a neighbor doing something similar in a front courtyard. I considered their garden along with a few other recent examples in my own area, and I felt that these relaxation or meditation spaces are being created by homeowners who are turning towards their own home, since they may not be spending as much time away from the house. Entertainment spaces in the yard have been common to one degree or another, but we may be seeing other garden spaces evolve, reflecting our needs. My meditation garden is based upon a space around a Catholic Church. My roots are Protestant, while the wife and children are Catholic. They wanted an alcove for the Virgin Mary, where they could pray. I wanted a quiet place to sit and reflect. When creating our garden, I thought that there are lessons for others planning their own special place. What you see in the photograph above is the beginning of the garden. As you can see, this is a small space that was fitted into the only free spot in my yard. This area was the path to the side garden. On one side, I already had a bed of lilies. The path was moved closer to this bed. An existing bamboo became part of the screen of this green. A large stone was moved to be a bench. 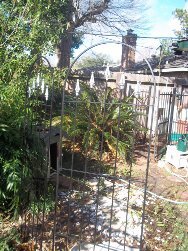 To complete the screen, I purchased two trellises. These seem to always come in basic black. If you notice, I took a silver paint for the finials. This makes the trellises different. Adding a little personal touch to an off the shelf item makes the garden special. The basic form of the garden is the shape of a cross. To achieve this cross, my girls and I used flat stones collected from my parents’ home in the Hill Country. We are not quite done with this project, but we have the shape. 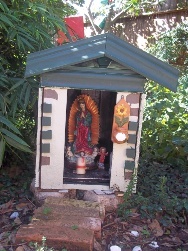 To create the alcove/house for the Virgin of Guadalupe, I went through my storage shed. I found wood for the frame as well as decorative trim pieces. I also discovered left over paint. My point here is that you may have the material to make an artistic piece, so you do not have to go out to buy something. The alcove frame is a vegetable crate. The roof and sides were made from old fence boards. The vase for holy water was a gift. I enjoy sitting on the large stone, and my girls go to say hello to the Virgin. To complete the space I needed plants. Since I began this project in late autumn, I found many plants on sale. I purchased two Knockout roses to go in front of the trellis. This bush has consistent flowers for me. In between the flat stones of the cross, I moved a thyme plant from another part of the garden. This makes for a nice fragrance. I did add some other plants, but I forgot about my dog. 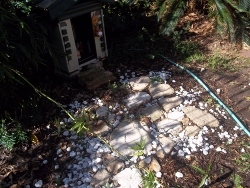 Curious about the new space, and wanting to put his own stamp on this garden, the dog rolled over the plants and stones. Instead of visually interesting smaller annuals, I should look into a bush that has some lasting blooms. You do not need to spend huge amounts to create a relaxing space. One of my favorite spaces is a chair, a table with a pot. This is near my children’s play area. I can relax to read a book, and they can play. A meditation garden is a good place to have when spending more time at home.